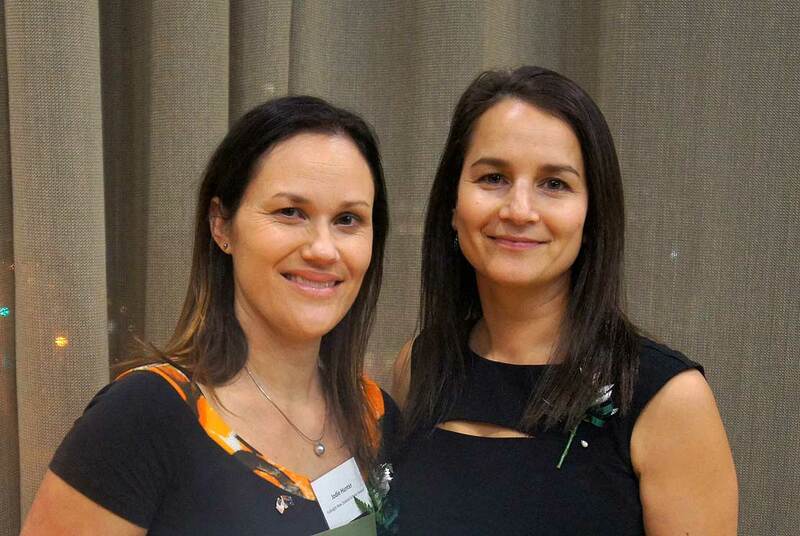 Dr Jodie Hunter and Dr Natasha Tassell-Matamua at the awards ceremony. Massey University Pasifika staff from the Manawatū campus received Fulbright New Zealand scholarships this week for their research on mathematics teaching for cultural minorities, and on near-death experiences. Education researcher Dr Jodie Hunter received a Fulbright New Zealand Scholar Award for her work into how diversity and equity can be addressed in mathematics education. Psychology researcher Dr Natasha Tassell-Matamua is investigating near-death experiences from Māori perspectives. Both women have Cook Islands origins. They are among 84 Fulbright New Zealand grant recipients for 2015, and part of a five-strong, all-women contingent of Massey Fulbright New Zealand award recipients. Two others are researching Māori cultural and health issues. Award recipients attended the 2015 Fulbright New Zealand Awards Ceremony and Alumni Reception in Wellington at Parliament Buildings on Monday, hosted by Chris Finlayson, United States Ambassador Mark Gilbert and Fulbright New Zealand chairperson Dr Helen Anderson, who is a Massey University Council member. Dr Hunter will travel to Tucson in August to investigate a culturally informed, mathematics-teaching concept developed by researchers and educators at the University of Arizona. The study grant will enable Dr Hunter to build on her extensive work with colleague (and mother) Associate Professor Bobbie Hunter at the Institute of Education. They have spearheaded a Ministry of Education-funded, culturally-attuned approach to address mathematics under-achievement in Pasifika and Māori pupils at low decile schools. Both the "communities of inquiry" being implemented here and the University of Arizona’s "funds of knowledge" approaches are based on the notion of bridging the divide between school and home. This involves teachers embracing students’ cultural values and family contexts, and involving parents in their children’s learning. These approaches are holistic in that they address the role and responsibilities of parents, students, pre-service and in-service teachers, Dr Hunter says. “Researchers and educators from the University of Arizona are leading experts in the field of developing multi-dimension programmes which draw on a 'funds of knowledge’ framework',” Dr Hunter says. “This model aims to address deficit perceptions of Latino students in schools by supporting educators to draw on the cultural, social and linguistic resources of students and their communities. “The Fulbright Scholar award will enable me to observe and analyse the range of programmes, and to establish what aspects can be adapted and applied for our Pasifika learners,” she says. School of Psychology lecturer Dr Tassell-Matamua, a leader in near-death experience (NDE) research, received the Fulbright-Ngā Pae o te Māramatanga Travel Award in Indigenous Development. She is heading to the US at the end of August to present at the International Association for Near-Death Studies conference, and then to visit with renowned NDE researcher Professor Janice Holden, at the University of North Texas. She will present findings of a recent study conducted in New Zealand and funded by an Emerging Researcher Award, which assessed knowledge about and attitudes towards NDEs and investigated the effect of NDE ‘education’ on well-being, including from a Māori perspective. “People who have NDEs are positively transformed by them,” she says. “Yet, those who do not have NDEs but learn about them can be affected in similarly positive ways. The beneficial implications of ‘NDE education’, particularly in relation to advancing Māori and Pasifika well-being, certainly warrant further exploration,” she says. Her project is part of an on-going programme of NDE research she is conducting in New Zealand, which aims to enrich global understandings of the phenomenon. “The unique socio-cultural compilation of the New Zealand population enables the programme to explore how cultural diversity is evident in and relevant to near-death experience research,” Dr Tassell-Matamua says. “The implications of incorporating culturally-validated spiritual knowledge evident in NDEs into specific health settings, such as mental health and palliative care, will also be addressed in my research,” she says. Fulbright New Zealand executive director Penelope Borland says that in this globalised and rapidly changing world, the Fulbright New Zealand programme is especially relevant. “New Zealand must ensure that its future leaders receive the best possible international education, as well as the broadest possible exposure to international thinking and trends. One of the aims of the Fulbright programme is to develop the thought leaders of tomorrow,” Ms Borland says. Rebecca Purvis will complete a Master of Science in Genetic Counselling at Arcadia University in Philadelphia. Ms Purvis graduated with a BSc majoring in genetics, and a PGDip specialising in bioethics from the University of Otago in 2014. She is currently completing a Certificate of Proficiency in Business Studies at Massey University. Dr Angela Moewaka Barnes presented her research into Māori filmmaking and Kaupapa Māori film theory at the University of Washington (Seattle and Tacoma), Denver Indigenous Film and Arts and the Native American and Indigenous Studies Association Conference (NAISA) in Washington DC in 2015. She is a researcher at Whāriki Research Group, College of Health. Tess Chalmers presented her research into Exploring Māori Identity Behind Closed Doors at the 13th Annual Hawai’i International Conference on Arts and Humanities in Honolulu, Hawai’i. She is a Doctor of Clinical Psychology candidate at Massey University. Does a brush with death affect sleep?